Chances are, if you’ve seen Dave Matthews Band’s “Crash” inexplicably pop up on your friends’ Spotify feeds recently, it’s because they just saw Greta Gerwig’s celebrated new film Lady Bird. The film breathes some new life into a pop-rock hit that has now become a dentist’s-waiting-room favorite, as well as other smash singles from the not-so-distant past: Justin Timberlake’s “Cry Me a River” and Alanis Morissette’s “Hand in My Pocket.” On Late Night With Seth Meyers, Gerwig revealed the unorthodox method she used to procure the rights for the songs. 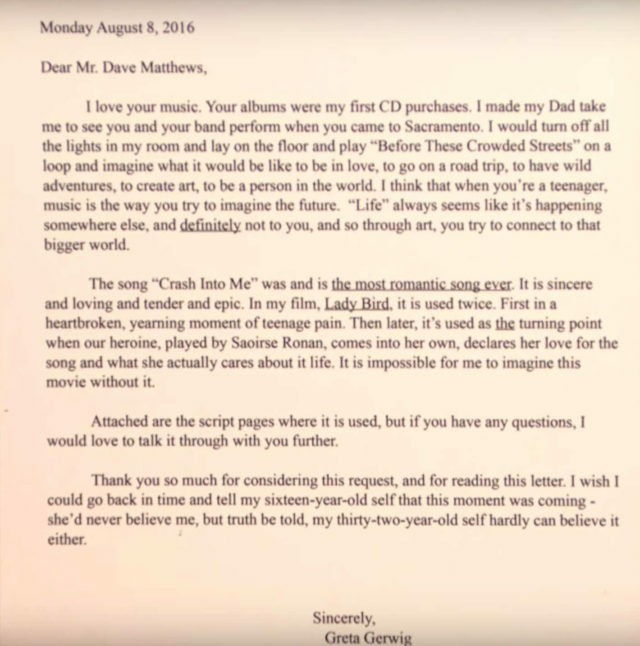 Gerwig wrote personal letters to Dave Matthews, Justin Timberlake, and Alanis Morissette. 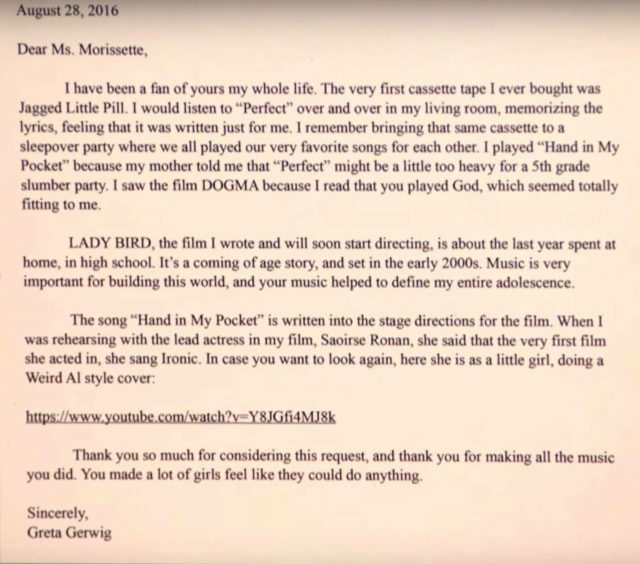 Gerwig’s JT letter features a strong opening argument–“I mean, what can I say? You’re Justin Timberlake”–and notes that she bought “both the CD and casette” of the Justified album in 2003 because her “car didn’t have a CD player.” In the Morissette letter, Gerwig recalls going to Dogma in theaters only because she knew Morissette played God in it, and to Dave Matthews, she wrote that his music made her imagine “what it would be like to be in love, to go on a road trip, to have wild adventures, to create art, to be a person in the world.” Watch Gerwig’s interview and read the letters below, courtesy of NBC.